Premise: It’s a Scooby Doo movie. What exactly do you think is going to happen? Gang go to place, find place is haunted, split up and look for clues, get chased around by a ghost and then find and unmask the bad guy. S’not exactly complex. Eheh. Remember the lengths I went to to try and convince everyone that I should be allowed to count Venom as a horror movie? I was really not intending to have this immediately turn up on the Wheel of Doom afterwards. Still, I don’t feel like I should have to argue too hard to justify this film’s appearance. After all, Scooby Doo is basically a kid’s introduction to both the horror and mystery genre. Hell, the Mystery Incorporated TV show had an episode that was an homage to freaking Saw of all things. They’ve covered all kinds of spooky movie monsters, many fake, some even real, so I don’t feel like I’m pushing my luck too hard including this. Plus, I really like Scooby Doo. As for why I picked this movie in particular, well, I’d already seen most of the really famous Scooby Doo movies like Zombie Island and the like, and this one only seems to have come out a short while ago so I thought I’d give it a try. I should note, I have absolutely no idea who any of the real life celebrities in this are, or really anything about the cooking world period, so I was going in a little blind. And honestly? I really enjoyed it. Admittedly, I wasn’t going into the movie with astoundingly high aspirations, at least compared to many of the other movies on this list. I was going in expecting a fun Scooby Doo adventure and it delivered more or less exactly what I was hoping for and maybe a little extra on top of that. 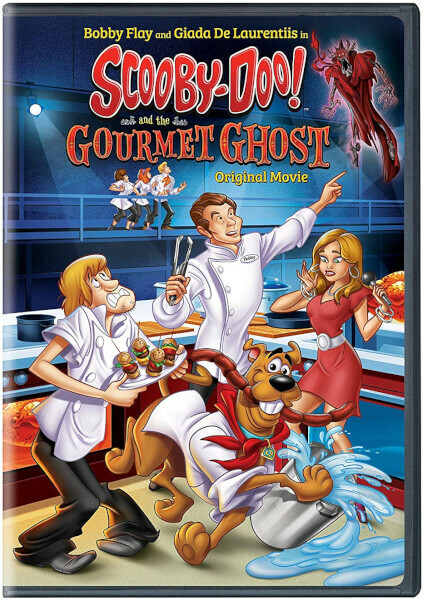 The jokes were sharp, the animation nice, the hijinks amusing, the side characters appropriately quirky (with special to Chef Sue, the psychotic Russian Sous chef who stole every moment she was on screen) and even the ghost had a fairly creepy design. Honestly, in some ways, my reaction to this is a bit like what I said when I reviewed The Howling, in that it doesn’t matter if your story is predictable as long as you tell it well, or at least make it fairly entertaining to watch. And in that regard, this movie pretty heavily delivers, with a lot of laughs and great character moments and a neat main villain, even if I did figure out who was behind it almost immediately. It’s basically just a Scooby Doo story, but it’s a Scooby Doo story told fairly well. Which is more or less all I can ask for. Is is Scary? : It’s a Scooby Doo movie. Is it Silly? : It’s a Scooby Doo movie!! !